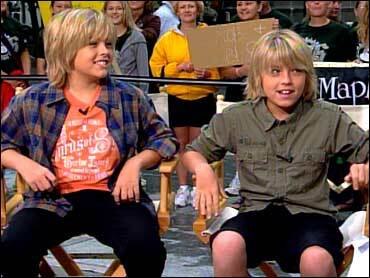 Life is a whirlwind for 13-year-old twins Dylan and Cole Sprouse. America first got to know them in Adam Sandler's 1999 smash hit comedy "Big Daddy." Now they're busy working on a new magazine called the Sprouse Bros. Code and starring in the Disney Channel's hit show "The Suite Life of Zack and Cody." Then there's the Sprouse product line which includes calendars, ring tones, deodorants and DVDs. But on Thursday, the twins took a break from their busy schedule to visit The Early Show. The identical twins told Rene Syler that they're enjoying all that work. "It's a lot of fun, just being there with the whole cast," Dylan said. "We have such great — I don't know — chemistry on the set. It's just — it's like going into work and seeing your family all day, so it's a lot of fun." They do make time for normal kid stuff, like school — even if that means having special tutors come to their set. "Yeah, it's a three-hour school day," Cole said, but the short school day isn't exactly every kid's dream. "Well, don't think we have it too good yet because you have to cram twice as much in," Cole said. "And sometimes we have to get extra hours of school, and then we have about six or something hours of work." But, the boys are big stars and even heartthrobs. Teenage girls are crazy for the shaggy-haired kids. But Dylan said it didn't all happen right away. "After 'Big Daddy,' it was really slow," he said. "We weren't booking a lot and we did a little bit here and there but, you know, we basically went back to school, did what normal kids do." The Sprouses had to wait until the sixth grade for their mini-empire to really take off. "Until then, we just went to a couple of meetings and then the show came up as an idea and, of course, we said yes right away, and it became something huge," Dylan said. "I mean, it's awesome now that it's finally totally developed." That show has become a big hit for Disney. In "Suite Life," the boys play twins living in a suite at an upscale hotel. It was Disney Channel's No. 1 series with kids 6-11 and 'tweens 9-14, until "Hannah Montana" premiered in March. "Suite Life" debuted in March 2005 and began airing seven days a week in January. It is now in its second season. The show's fans can't seem to get enough of Dylan and Cole. They keep an eye out for the Sprouse twins in real life, too. "We were in a mall one time," Cole said about their new-found fame, "it was, like, just when the show aired, and this girl was walking the mall — like across the mall — and she sees Dylan and she faints. She fell on the floor." "I was like, 'What?' " Dylan said. "Like, she was literally there for one minute. I looked, and then she was gone." The boys are hoping to translate that kind of influence on their fans into the new magazine. They're working with the same company that made another pair of twins — Mary Kate and Ashley Olsen — into household names. But the Sprouse twins are shooting for a different audience than their female predecessors. "Code is more boys. We want it to be more boys because so many girl magazines out there right now," Dylan said. "If you look, there's nothing for guys. I mean, sure, there's a couple gaming magazines and a couple surfing and skating and all those magazines, but we just want them all in one. We don't want to pick up four different ones and pay so much for that one and that one." The twins said Code will have everything their fans need. The first issue will hit newsstands July 18, 2006.